New Market Inn, from the southeast, circa 1950. During the winter months I try to get out and investigate the parts of Randolph County that are not so accessible when the animal and vegetable elements of creation awake in the spring and summer. Saturday March 30th, 2013, was a beautiful warm and sunny day, and as I was driving down 311 I steered through that odd left-hand crook in the road in Sophia that I’ve wondered about a thousand times. Whether going north just past New Market Elementary School or south just past Marlboro Church Road, cars must jog left as 311 for some unexplained reason swerves in its path beside the railroad. As a historian I’ve long been aware that this is the site of the New Market Inn- the one colonial or federal inn that retained its identity into my generation. For some reason I’d decided or been told ages ago that the inn itself was on the lot where a garage and auto salvage yard now covered all the acreage, but this last Saturday B.U. (Before Undergrowth) seemed like a good reason to double back and check out what my friend Colon Farlow recently asserted to me: that the inn wasn’t on the garage lot, but on the adjacent lot just to the west, a wooded lot now for sale. 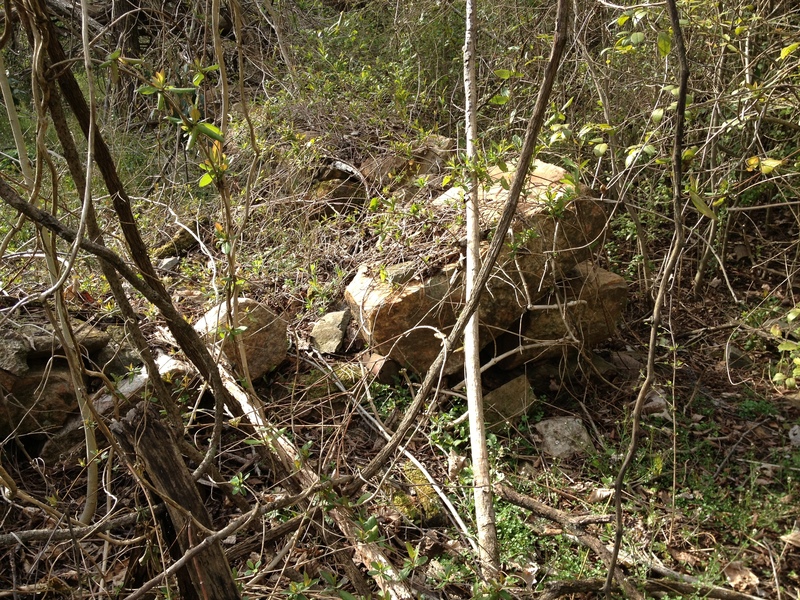 Not only did I stop and hike that lot, I got the first tick of spring for my efforts, so here’s the story. New Market Inn, circa 1940. In my book Randolph County: Images of America, the New Market Inn is illustrated on page 70 (and shown above) in a photo taken in 1935. 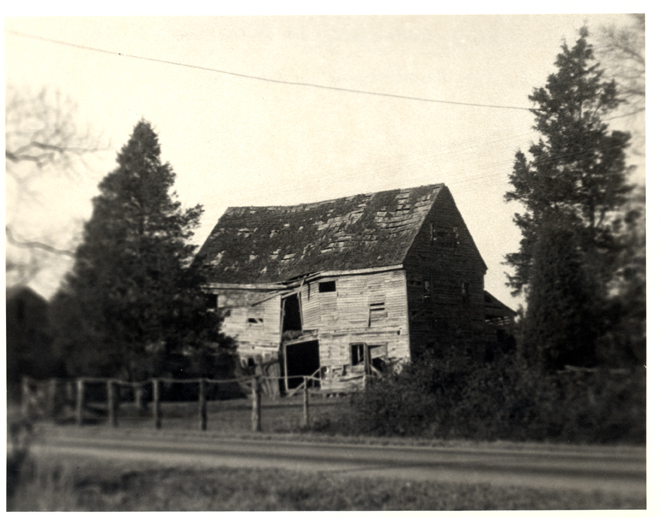 This and one other image of the building in the historic photo database at the county public library document the house after its demotion in status into use as a barn, and before it collapsed or was demolished circa-1960. They show a house that architectural historians would term “Georgian,” the style that takes its name from the 18th century kings of England and is usually reserved to structures built before 1810. Georgian style houses show a strong formal symmetry, often with a five-bay center-hall plan. Georgian proportions emphasize verticality, with tall, narrow windows and steep roofs and boxed cornices which are cut flush to the gable ends. In Piedmont NC such houses were always of heavy timber construction, as brick was too expensive to use for residential bearing walls until the 1830s. Interiors would have had simple finishes, with exposed floor joists, raised panels on doors, mantels and wainscots, and enclosed “dogleg” or “boxed” stairs. Conversion of the house into a barn has removed most of the decorative information I usually use to date a structure, and there are no photos of the interior known, but exterior photos of the New Market inn definitely exhibit the Georgian vertical emphasis and the symmetrical five-bay plan. 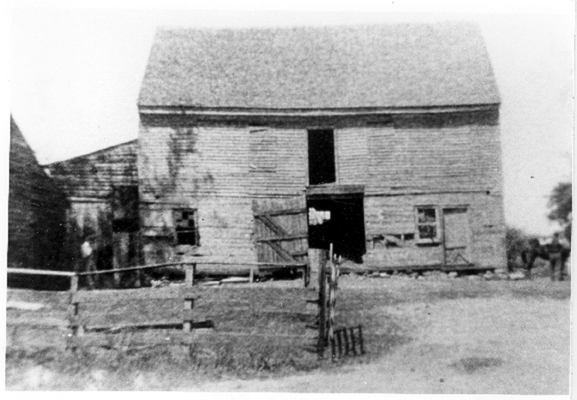 The entrance door has been expanded into a barn door, but on the second floor what appears to be an original door opening suggests that the house had a center-hall plan. Most of the windows have been removed and boarded up; the two remaining may have been reused from other locations, as they appear to be short 6×6 sash. Visible through the open center door is another window on the far side of the house; it is located where a door should be, but the shadow appears to indicated a repurposed 9×9 sash. At the lower southeast corner an assymmetrical door and window could be later changes to the original plan; they may also mark the location of a separate entrance to the inn’s tap room. The second, slightly later photo is a valuable view of the eastern side, showing the steep roof pitch of 10 or 12 inches of rise to every foot of run. The attic floor has two narrow windows crowded into each side gable, leaving space for a large end chimney which, if it existed, has been removed. A shed-roofed one-story addition is visible to the north side; the large barn-like additions on the west which were visible in the previous photo are here hidden behind a large cedar tree. The later photo documents a catastrophic structural failure progressing in the west-central portion of the house, where the inward slump indicates that the floor joists have rotted or been removed. 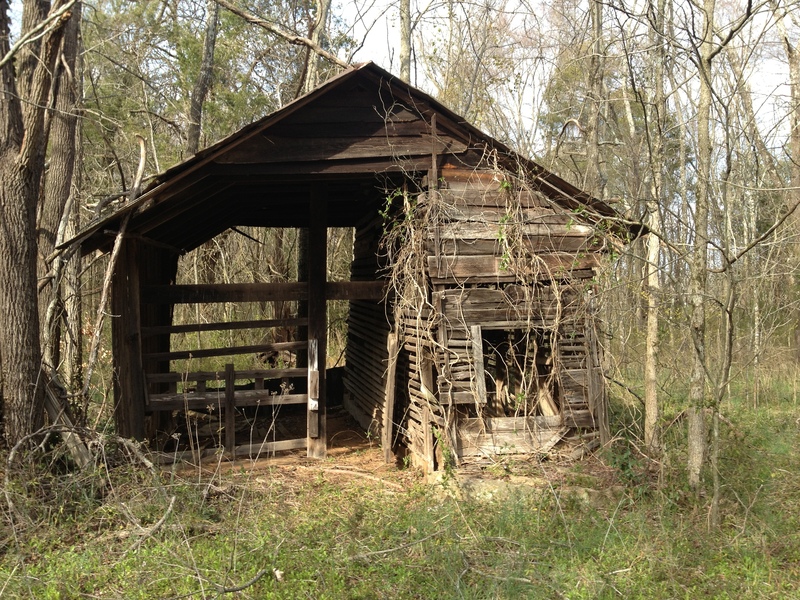 On my exploratory hike, the only standing structure I found was this corn crib/ tractor shed combination, probably dating to the 1930s or 40s and of little interest. Much more unusual was the blooming carpet of purple “Grape” or “Roman” hyacinth, which covered at least an acre southwest of a stone foundation. The briars, brush and vines, even in their temporarily leafless state, did not allow close inspection, measurement or adequate photography of the foundation. By my analog paced measure, the fieldstone foundation is 10-12 inches above grade and measures approximately 30 feet wide by 45 feet long. A water-filled depression indicates a cellar under the western end of the structure, at least 15 by 30 feet. 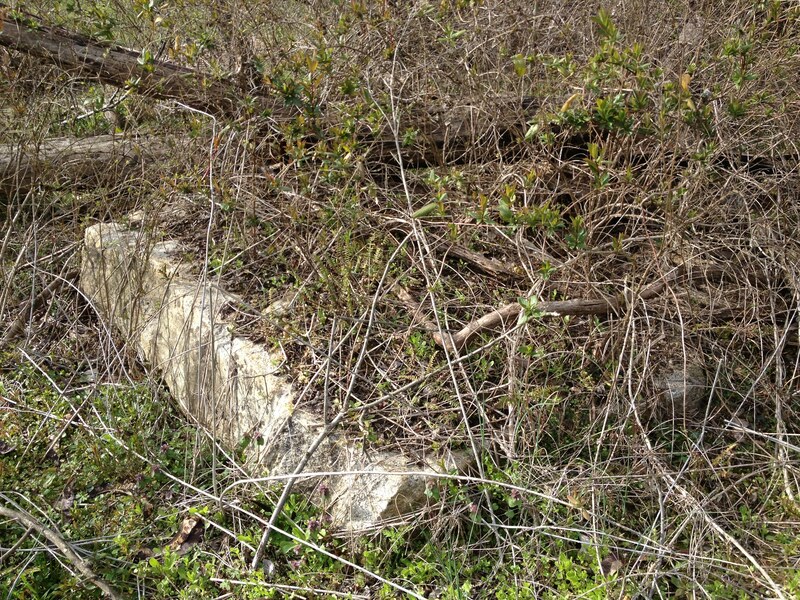 A flat 4 by 5-foot rectangular stone a foot thick lies near the center of the façade, and another one approximately 2 by 4 feet lies at the southeast corner. Both may have been step stones to the doors shown on the photos. Chimney bases are not discernible to the east or west, but a large pile of brick and stone inside the foundation could be the remains of a chimney positioned either at the west end or at the center of the house. Today the old tavern, known formerly as one of the best on the Plank Road, is a barn, sheltering the owner’s stock and housing the hay and fodder. The chimneys have crumbled to dust, the front door has been replaced by a big swinging barn door, and the steps are gone. 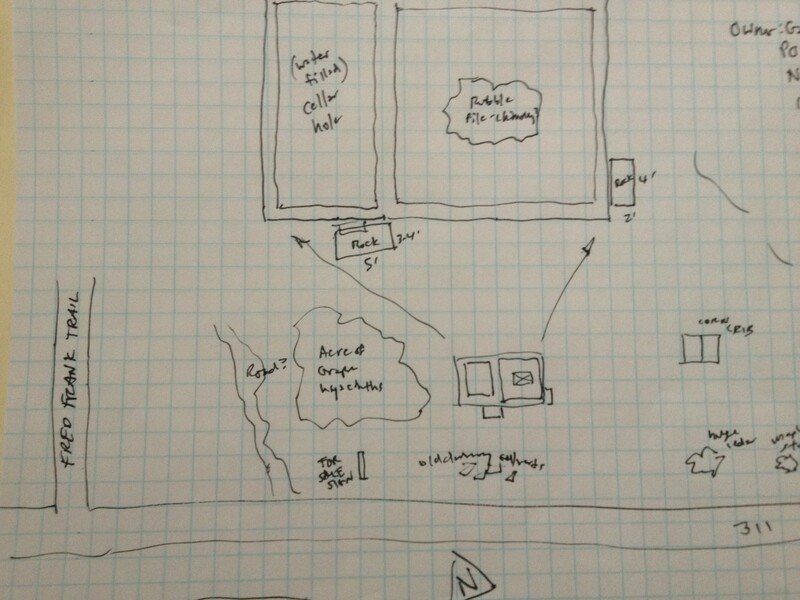 An investigator will find that there were eight rooms downstairs besides the dining room and kitchen. On the second floor were a large hall and six bedrooms. At the top of the narrow stairway the third floor consisted of two big loft rooms. The remaining windows are very narrow, the ceilings are low, and the wood has been painted several different colors. There are several original handmade doors. The fireplace used eight-foot logs. At one corner of the house is a huge, long rock which some say was an “upping block,” others a doorstep. Hearthstone, Doorstep or Upping Block? This is an old settled place, and was the home of Capt. John Bryant, a Whig, who was shot in his old house by Colonel Fanning. The place afterwards came into the possession of Shubal Gardner, who had a store there and was regarded as a big man. He owned a number of lots in Johnsonville and at one time drove a heard of beeves to Philadelphia. Joseph Newlin bought the property in 1840 and called it New Market and for many years carried on an extensive store and tin shop. To fully examine all these personalities involved with the property will take additional posts!